Big smiles. That’s what describes the reception the new Ridgway Railroad Museum book received when I dropped off the copies that the printer had delivered the day before. The book, full of great stories and old-time b&w photos of various railroads in the San Juan Mountains of Southwestern Colorado, is now available at the museum and also through our catalog. I put the “order now” button up last night and already had orders today. 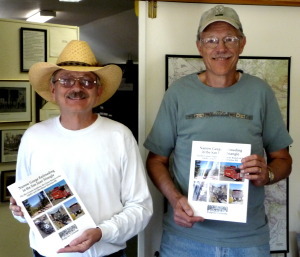 Check out the catalog and the book, Narrow Gauge Railroading in the San Juan Triangle: The Rio Grande Southern, the Ouray Branch of the D&RG and Otto Mears’ Silverton RR. You’ll be delighted too! This entry was posted in Mt. Sneffels Press, Railroad. Bookmark the permalink.